The Hotel Newton sign does not seem to include the name, Newton. Only: "HOTEL / Single / Double Rooms / Bath / 1-2 Room Suites / Modern Kitchenettes? / Transients / Residential / Sensible Rates." Click for detail on Newton sign. The Office for Metropolitan History (www.metrohistory.com) gives the following on the Newton Hotel: (year) 1902 (DOB NB#) 72 (cost) $230,000 (description) 9-sty brk and stone hotel, 50.4x107 (owner) Chas J Judson / 842 St Nicholas av (architect) Ross & McNeil / 39 E 42d [42nd] st. This ad for the Hotel Newton appeared in the New York Times, 20 June 1919. An advertisement in the International Railway Journal, 1918, read, "Hotel Newton, 2528 Broadway, between 94th and 95th Sts. Subway express station at 96th St. The NEWTON is within 10 minutes of Grand Central Station and Penns. R. R. Station. Accommodates 200 people. Rates, single, $1.50 to $4 per day; double $2 to $5 per day. Unexcelled service. Samuel A. Loper." Identical was this ad from the Hotel Red Book, 1920. A classified ad in the New York Times, 24 April 1954, read, "94 St & Broadway / MO 6-6500 / HOTEL NEWTON / 1 1/2 & 2 rms, mod kitchn'tts, baths, full hotel services. Also singles, doubles" (click for image). The New York Times printed dozens of notices of meetings and other gatherings at the Hotel Newton during the 1920s and 1930s. Then in 1945 appeared the notice: "Charles N. Whinston, architect and industrial designer, ... has completed plans for the rebuilding of the ballroom floor of the Hotel Newton, 2528 Broadway, and conversion into suites at a cost of $30,000" (28 Nov. 1945, p. 38). 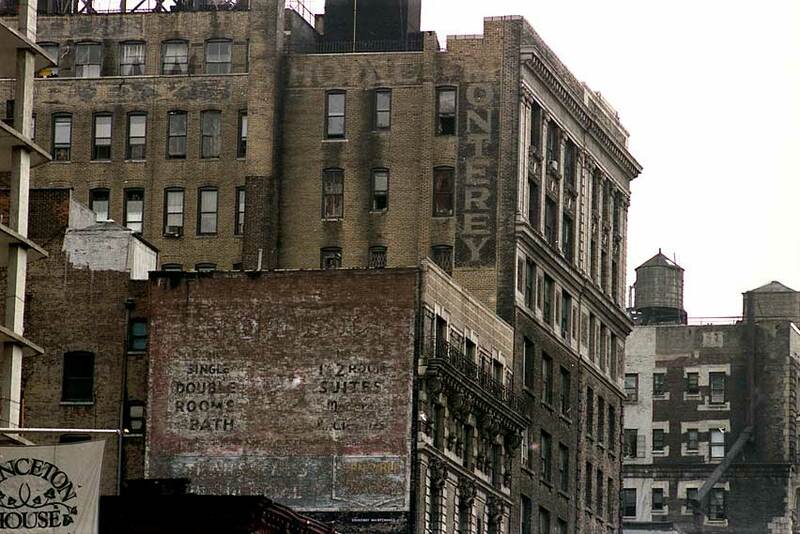 The Hotel Newton sign was painted by Broadway Maintenance Corp. The Museum of the City of New York website shows the Newton Hotel sign in a photograph dated 2 June 1920. This is an earlier version of the sign - i.e., earlier than my photograph above. In 1913 plans were filed with the New York City Department of Buildings for a 12-story brick and stone hotel on a plot 33 by 114 at 2520 Broadway. The owner was Harry Schiff, 355 West End Ave., and architects were Schwartz & Gross, 347 5th Ave. (www.metrohistory.com). In April 1913 Engineering Record, vol. 67, no. 16, 19 April 1913, pg. 46, reported, "Plans have been filed for the erection of [a] 12-story brick and stone hotel at 2520 Bway. for Harry Schiff, cost $200,000, Schwartz & Gross, Archts., 347 5th Ave." A month later in its issue dated 8 May 1913, Engineering News reported, "Harry Schiff, 355 West End Ave., has awarded a contract to Raitch Bros., 1182 Broadway, for the steel construction work for the 12-story hotel, 114x34 ft., which he will erect at the northeast corner of Broadway and 94th St. Schwartz & Gross, 347 Fifth Ave., are the Archs. The estimated cost is $200,000." This was the Monterey Hotel, which opened in 1914 under the name Hotel Apthorp. This ad appeared in the New York Times, June 1914, shortly before the Hotel Apthorp opened. It did not take long for William Waldorf Astor, whose Apthorp apartments at Broadway and 79th St. bore virtually the same name, to take exception to the use of the Apthorp name. According to The Trade-Mark Reporter, volume five, published by the United States Trade-Mark Association, 1915, the courts ruled in favor of the hotel. However, this ad from December, 1916, announced that the name was being changed to the Hotel Monterey. Alterations to the newly re-named Monterey Hotel were reported in The American Contractor, 2 Dec. 1916, pg. 58, "Apt House (annex. ): $400,000. 12 sty. 42x140. 29x160. N. E. cor. Broadway & 94th st. Archts, Schwartz & Gross, 347 Fifth av. Engrs. Moses Pope & Messer, 366 Fifth av. Owner Broadway & 94th Realty Co., Inc., Harry Schiff, pres., Hotel Apthorp, 2520 Broadway. Rfg. let to New York Roofing Co, 635 E. 19th st. Elec work let to New York Edison Co., Irving pl. & 15th st."
The name remained Hotel Monterey through 1976. It then went through several name changes until the early 2000s when it became a part of the Days Inn / Quality Inn chain. The entrance canopy read Days Hotel in 2008, as it does currently (2016). The original owner and builder of the Hotel Monterey was Harry Schiff (1869-1939). Harry Schiff's obituary in the New York Times, 21 Oct. 1939, pg. 15, read, "Harry Schiff, real estate operator who built several hotels and apartment houses on the Upper West Side, died yesterday at his home in the Hotel Embassy, Broadway and Seventieth Street. He was 70 years old. Over a span of thirty-five years Mr. Schiff built the Hotel Monterey, Broadway at Ninety-fourth Street; the Embassy and several apartment houses on Central Park West, West End Avenue and Riverside Drive. At most periods in his career he owned at least ten or twelve buildings, but after holding them a few years he usually sold and built new ones. He made his home in the Hotel Monterey for a time and in other of his buildings. Born in Russia, he came to this country in 1888 and began as a peddler in New York. He soon entered the general merchandising business moving for a time to Texas, before he entered real estate. Mr. Schiff was chairman of the American committees which raised funds for Hebron Yeshiva in Palestine and Mirrer Yeshiva in Poland, Jewish educational institutions. He also was active in Jewish charities here. Surviving are two daughters, Mrs. Bertha Goodfriend and Mrs. Estelle Parker, and four sons, Leo, Isidor, Arthur and Gerard." In 1924 Harry Schiff bought the Hotel Newton and became owner of both the Newton and the Monterey: "The Hotel Newton, a nine-story fireproof modern building on the easterly side of Broadway, seventy-five [feet] north of Ninety-fourth Street, has been purchased by Harry Schiff from the Comey Estate. It adjoins the Hotel Monterey, also owned by Mr. Schiff and was acquired through Slawson & Hobbs, as brokers. The Hotel Newton is a nine-story building, fifty feet front on a lot 135 feet in depth. After making extensive alterations the Hotel Newton will be operated in conjunction with the Hotel Monterey. Mr. Schiff's entire property holdings at this point now consist of ten lots, or about 25,000 square feet running from Ninety-fourth to Ninety-fifth Streets. Mr. Schiff has operated with great success the Hotel Monterey since it was built and is one of the foremost builders on the west side, having built the following twelve-story fireproof apartment dwellings: Northwest corner West End Avenue and Eighty-second Street, southeast corner West End Avenue and Eighty-eighth Street, northeast corner Riverside Drive and Ninetieth Street, northeast corner West End Avenue and 105th Street, and others" (New York Times, 6 Jan. 1924, pg. 14W).